Why write this — a ramble on a curious drink that was in its prime a century ago? Because simple living does not have to mean dull living. Because a straightforward pleasure, like a good drink, can be complex and almost magical affair. And because some may say absinthe’s resurgence is a hipster folly, like the resurgence of vinyl LPs, but I’m too old to be a hipster, and I freaking love both the rite and the taste of absinthe. That’s why. Three parts are water. Two parts are this mysterious elixir, emerald and more potent than something pretty should be. And a tiny cube of sugar. But that’s not the right order. The absinthe is first to go in the glass. And take a minute here to pick up the glass and give it a long sniff. The aroma of anise and fennel is unmissable (indeed, this likely is not a drink for someone who eschews licorice jellybeans come Easter — though Jenn pleads exception to this). Hold the glass to your eyes and survey view the room through an alien lens. This will be the last time you can see through the liquor. Then it’s the absinthe spoon over the glass. Why it’s called a spoon is a mystery to this drinker. It’s most clearly a spade, with a ridge across the handle at midpoint so the utensil settles onto the rim of the glass. The broad part of the tool is filled with slots, which are this device’s hero feature, as you will see in the next part of the mixing. Set the sugar cube on the absinthe spoon. It’s crystallized white edges give geometry to a drink that is otherwise abstract in form. And then, at last, pour the ice-cold water, in the tiniest of streams — or drop-by-drop for the more patient — over the cube. When the cube begins to saturate with water, watch the drops whiten and sweeten as they run over the edges or down through the slots to carry the sugar into the green pool below. Slowly the absinthe turns from a deep lime green to a milky color, akin to a pistachio ice cream. When you’ve drizzled all of the water through, grab the spoon and give the drink a swirl. You’re ready for a sip. It’s not that it’s terribly strong. It’s often more than 100 proof out of the bottle, so between whiskey and Everclear on the potency scale. When cut down with water by two-thirds, it’s under 40 proof. That’s port and sherry territory. No, you’re sipping it to savor what it does to your mouth. Absinthe doesn’t evolve on the palate like wine or whiskey does. It doesn’t transform from one flavor to another. Instead, it transforms your tongue physically. Drink too fast and you’ll bludgeon that complex sensory organ in your mouth. Pace yourself and you’ll feel just a tingle with the first taste of the absinthe. With a few sips, your tongue grows numb. After a glass, your mouth will feel pleasantly sedated. You’ll still have your wits about you, but you’ll be in a better mood. Absinthe was notoriously outlawed in the States for many years, for fear that the trace amounts of certain chemicals in the drink were extremely addictive or even hallucinogenic. 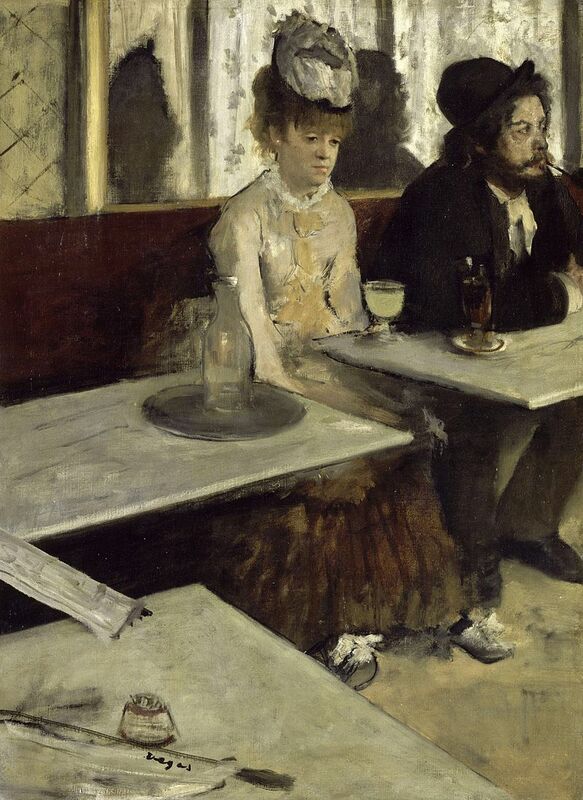 Just look at all the forlorn, estranged faces in the Toulouse-Lautrec and Degas paintings of patrons hanging over tables in absinthe houses, folks must have reasoned. Their brains were rotting because of the absinthe, right? In fact, absinthe is no more harmful than other alcohols. Those long faces in the paintings? Well, the root of their problems must just have been poverty in the 1920s. The United States, like most countries that prohibited importing, selling, or making absinthe, has lifted the ban. So you can lift your glass. Eventually, that is. With purpose and ritual.